Music student Perttu Pölönen had an idea. There are 12 notes in the classical Western scale -what would happen if you placed those notes on a clock face? With this in mind, Pölönen created the Musiclock, which was later reworked into an app. And there is still more to come. Fifteen-year-old Perttu Pölönen was sitting in the library studying music theory, presented via mathematical grids. The young student grew frustrated with the difficult way the theory was being visualised, and began to think how to display it in a more practical way. He came up with the idea of a music clock, inspired by the clock face. Pölönen constructed a round clock out of cardboard, complete with the 12 notes of the octave superimposed on the numbers of the clock. “When you rotate the disc on top of the Musiclock to point to any of the 12 notes, the clock shows you all of the notes in the major scale of that key. Minor scales and triads can be found on the flip side of the disc,” Pölönen explains. Pölönen had been making music from a young age, learning the cello and piano, but had no deeper understanding of music theory. In his experience, many advanced high-school-age music students drop out of music theory classes due to the subject feeling like a chore. “I was wondering how to present ideas in such a way that they would be easier to ground in muscle memory. Do you really need staves to learn music theory, or pen and paper for that matter? 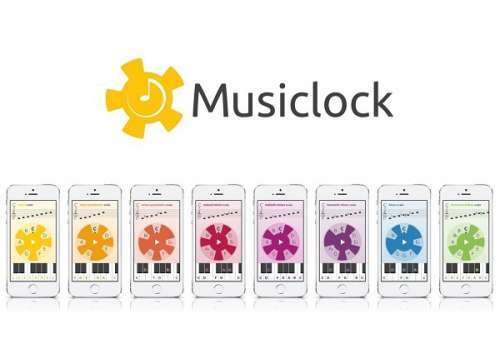 The Musiclock combines visual imagery and muscle memory functions,” Pölönen explains. The young inventor tested the functionality of his innovation by teaching his young cousin. She learnt even the trickiest scales after just a few repetitions. Currently a composition student at the Sibelius Academy, Pölönen entered his innovation into the 2013 European Union Contest for Young Scientists, among other competitions. “There were all these chemistry, maths and biology prodigies, and there I was with my Musiclock, which I found a bit amusing. I competed in the Social Sciences category, which often includes contestants from the field of psychology, for example. But in the end I took home the trophy with my Musiclock,” he laughs. The twenty-something Pölönen has brought home a string of other awards as well, starting with winning the 2012 Innolukio competition for upper secondary school students. Together with his brother, he started his own company in order to develop and promote the Musiclock. An app for mobile devices is also available in 100 countries, sold by the media giant Apple. Pölönen says that it has been the best-selling app in nine different countries. The wooden Musiclock is being marketed in Finland for teaching and home learning purposes, and it has been piloted at the Espoo Music Institute as well as in several schools in the Helsinki region. The response has been enthusiastic, both from students and teachers. The mobile app and the original Musiclock have been created for slightly different purposes. “The app is meant for jamming and improvising, whereas the Musiclock is best suited for teaching,” explains Pölönen. He feels that playfulness and experimentation are important resources that should be exploited more in music education. “ln the pilot project, the app was tested with primary school students, and it offers activities such as different interval games. Students have also created their own versions of the games. This is how an app should work at its best,” Pölönen enthuses. The mobile app is also suitable for adult music lovers. lt includes backing tracks in many different genres, ranging from blues and rock to pop and bebop. By rotating the Musiclock, you can try making music in any genre by choosing any key you want and then simply playing on top of the chord progressions. 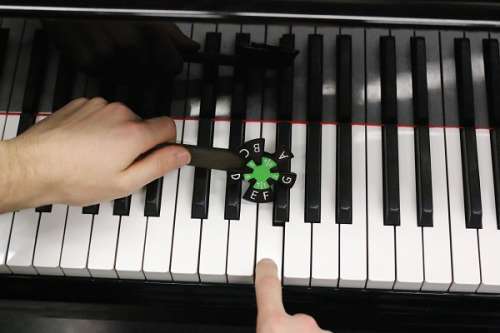 Pölönen has also developed a tiny Piano Scaler, which sits on top of the piano keys and shows the correct notes of the scale in any key, exactly like a Musiclock. The Piano Scaler is aimed directly at the international market and is being financed through a crowdfunding campaign. All three products are a part of a more extensive method that Pölönen intends to develop further in the future. These products will eventually be complemented by other learning materials, but the time is not right yet. Pölönen is currently studying part-time to be able to advance his career. His dizzying pace includes studying, working on his easy-to-grasp innovations and running his business. What is the source of all of this business drive and innovation? “My family has no business background, but I was the youngest of four siblings in a country family and I have always had an experimental and independent nature. Even as a young child I kept coming up with all kinds of projects,” he reminisces. The young inventor thinks that decision-makers play a significant role in the future of different innovations. While there is no need to completely change or dismiss old teaching methods, new innovations and applications can offer a good supplement or alternative. “It goes without saying how important it is that decision-makers have a good understanding of the field in question, for instance music, when it comes to innovations becoming successful or recognised. Let us hope that Musiclock will help to build this awareness,” Pölönen sums up.